Our workshops are able to work all types of cables (PVC, cord, silicone, flat,….). We have over 1200 mini-applications that allow the setting of all types of terminals from 0.16 to 120 mm². 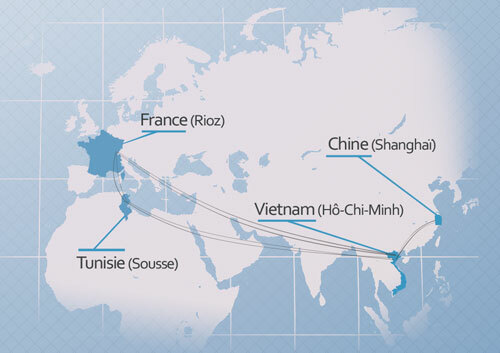 In France, our logistic structure of RIOZ , centralizes and organizes all production units. It integrates our project teams , methods , purchase and trade. Each unit has technicians and engineers ready to accompany you in the realization of your project. Your cables, cords, harnesses, molding, sub-assemblies are designed and equipped by specialized personnel to meet faithfully your needs. Our weekly shuttles insure flows between our units and allow deliveries “just in time” on our customers’s production lines. The flexibility of our structure, the synergy of our group and our production site Low Cost, allow you to have a unique level of expertise and reactivity as well as a real control of costs and deadlines. At your disposal, we consider it essential to know you and create a relationship of mutual trust.